Finnfund is a development financier which builds a sustainable world by investing in responsible and profitable businesses in developing countries. We provide businesses operating in developing countries with risk capital, long-term investment loans, mezzanine financing and expertise on how to invest in the developing markets. We expect our projects to be profitable, socially and environmentally responsible and produce measurable development impact in their target countries. We put special emphasis on sectors that are critical to sustainable development, such as clean energy, sustainable forestry, sustainable agriculture and financial services, but we do invest in other sectors as well. Finnfund invests in businesses that drive sustainable development, whether they are companies are already operational or in the process of being set up. Every year, we make 20-30 new investments worth 150-200 million euros. At the end of 2017, Finnfund’s investments and commitments in 171 projects in 39 countries, totaling 719 million euros. Finnfund gets its funding from the State of Finland and the private capital markets, as well as retained earnings from its investments. All profits get recycled into new projects that drive sustainable development. 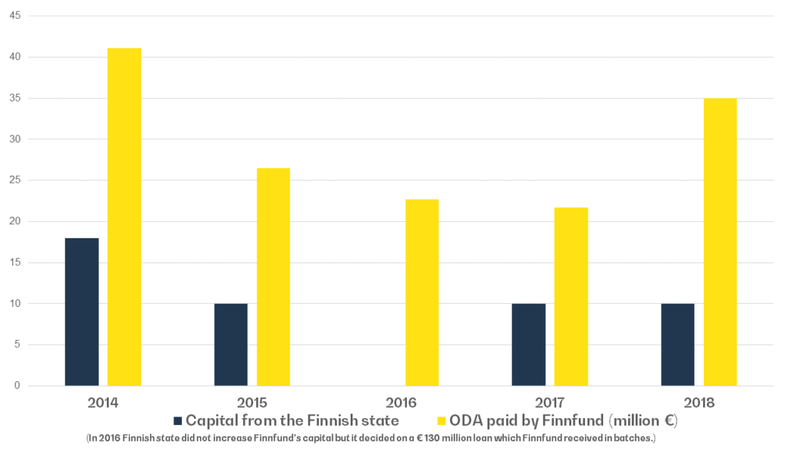 Finnfund’s payments calculated as Finland’s official develpoment aid (ODA) are always at least twice the amount the Finnish state pays to Finnfund as capital increase. Finnfund is owned by the Finnish State (94.1%), Finnvera (5.8%), and the Confederation of Industries (0.1%). Currently we have 80 employees based in Helsinki. Finnfund belongs to the group of European Development Finance Institutions, EDFI. Finnfund provides administrative support for the Finnpartnerships programme led by the Ministry for Foreing Affairs. Finnpartnerhip offers funding, contacts and advisory services, which can be used to assess business opportunities in developing countries. All Finnfund activities are guided by four principles: Impact, responsibility, profitability and professionalism. The steering by shareholders has been assigned to the Ministry for Foreign Affairs. At the end of 2017 Finnfund had made 719 million euros worth of investments and commitments in 171 projects across 39 countries. Finnfund offers a unique opportunity to be part of the change in developing countries and development finance. Finnfund currently employs 80 experts in finance, development impact, corporate responsibility and administration. They are based in Helsinki.